A Missouri Homeowners Insurance policy will cover everything in your home you can pick up and move. Your appliances, furniture, clothing, dishes, electronics, etc. If you can take it with you, it is covered under Personal Property (also known as Contents). What about your lawn mower and tools in the building or shed behind your home? Covered. Your Personal Property coverage will extend to items in buildings not attached to your home. TIP: Your car or truck parked in your garage is not covered by your homeowners insurance. Autos must be insured on an auto policy. There are 2 questions you need to ask yourself as a homeowner. 1. Do you have replacement cost coverage on your Personal Property? Should you have a loss that wipes out a significant portion of your personal belongings do you want to be paid what they’re worth today or what they were worth when you bought them? Replacement Cost coverage will replace your living room furniture you bought 8 years ago. On the flip side, Actual Cash Value coverage on your Personal Property will imply depreciation is factored into your living room furniture. Do you really think your 8-year-old living room furniture is still worth $5,000? Actual Cash Value means the insurance company will pay you today’s value for the living room furniture, minus your deductible. Replacement Cost will give you new for old. Be sure this is what you have. 2. Have you ever completed a home inventory? If you lost everything do you think you will remember every item in every room of your home? Take a little time and go through your home, room-by-room. Either with a pen and paper or take pictures, even a video. Then save it to a jump drive and store it in a lockbox. You could even save it to the cloud (Dropbox, Google Drive, etc). Store your home inventory somewhere safe. Should the sudden and unexpected happen, you can retrieve it. TIP: Don’t forget to update your home inventory every so often. 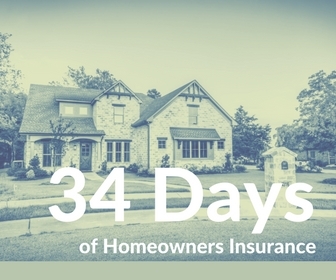 Interested in more 34 Days of Homeowners Insurance?